So your organization has made blended learning a priority. But while you know you need to move your training programs into the future, you wonder how doing so will affect learning results. And though some of you have tried blended learning before, the programs didn’t meet your expectations and you worry about trying again. A strategic plan quells these fears and improves the likelihood of program success. 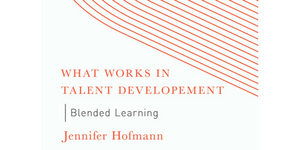 Get started with Jennifer Hofmann’s exclusive blended learning instructional design and implementation model: Campaign Blueprints.